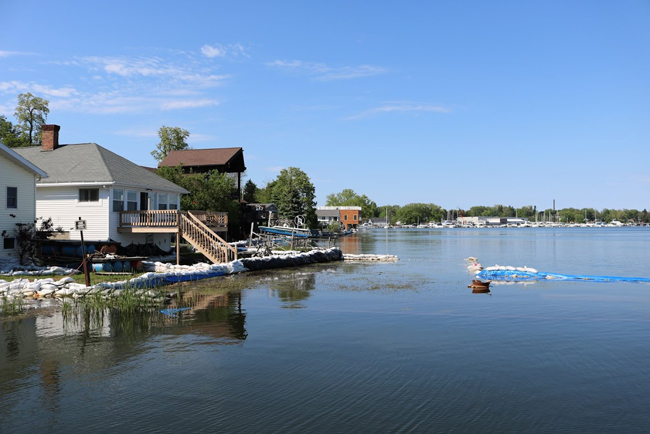 Lake Ontario communities inundated with high water in 2017 will benefit from a flood risk modeling project underway at Cornell University with recently-awarded funding from NOAA. The project is sponsored by New York Sea Grant. Credit: Mary Austerman, New York Sea Grant. Scientists are seeking solutions for harmful algal blooms and better aquatic invasive species detection, as well as ocean acidification, flood risk, and a pervasive microbic food-borne pathogen. Stony Brook, NY, May 1, 2018 – Five new two-year coastal research projects get underway in 2018, with a total amount awarded of just over $1.1 million. The projects are sponsored by New York Sea Grant (NYSG) and funded through the National Oceanographic and Atmospheric Administration (NOAA), Sea Grant’s federal parent agency. “New York Sea Grant is pleased to sponsor this new research that is vital to protect and enhancing the quality of New York State’s water resources that are an essential economic driver not only for our coastal communities in the Great Lakes region, but for all of New York State,” said Cornell Cooperative Extension Assistant Director and NYSG Extension Associate Director Katherine Bunting-Howarth. One researcher aims to better understand nutrients in sediment and their connection to harmful algal blooms (HABs). "2017 was one of the worst years for brown tide and red tides that cause paralytical shellfish poisoning," said Stony Brook University researcher Christopher Gobler. 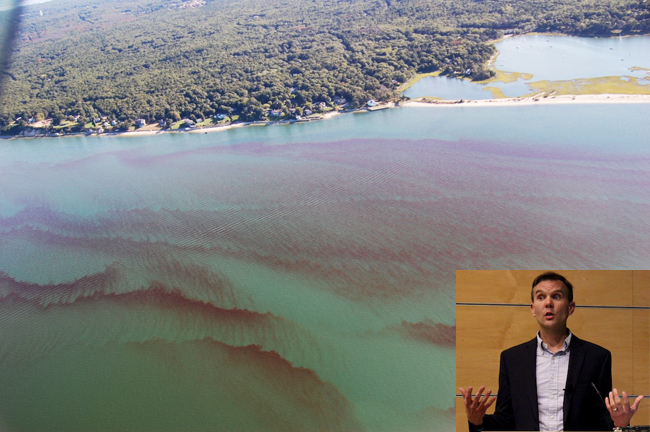 Last summer, Long Island's waters experienced a 10-week-long brown tide, one of the longest and most intense on record. "What began at an ominously early time (early May) and in a strangely uncommon place (South Oyster Bay)," said Gobler, "spread to cover the entire south shore of Long Island by early June and persisted through late July in Great South Bay," which is pictured above. "As the most intense brown tide ever, it reached reaching peak intensity of 2.3 million cells per milliliter in Bay Shore in early July." Credit: Auxiliary Coast Guard; (insert) The Peconic Bathtub. Christopher Gobler of Stony Brook University (SBU) will host workshops on HABs and water quality in Long Island estuaries. He will study concentrations and exchanges of nitrogen (a growth nutrient for various algal blooms) between estuarine sediments and the overlying waters. HABs degrade water quality, and can lead to hypoxia (oxygen-depleted waters), acidification (a process by which absorption of carbon dioxide gas produces a pH imbalance in these waters, making them more acidic), fish kills, and decline in valuable bivalve species (e.g., oysters, clams, mussels, scallops). Another new research project aims to develop an inexpensive method for detecting invasive aquatic species based on DNA. 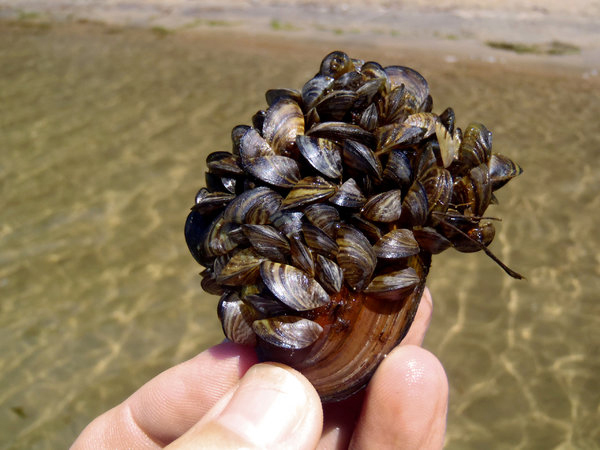 A cluster of invasive zebra mussels attached to a native freshwater mussel. Such infestations lead to the larger mussel’s death. Credit: D. P. Molloy/University at Albany. David Lodge director of the Atkinson Center for a Sustainable Future and a professor in the Department of Ecology and Evolutionary Biology at Cornell University, will develop an inexpensive environmental DNA-testing method for the earlier detection of aquatic invasive species and co-detection of multiple species to assist coastal resource managers at less cost than current detection methods. Field testing will take place on Lake Erie and Lake Ontario. A third project will explore connections between seagrasses and ocean acidified waters. 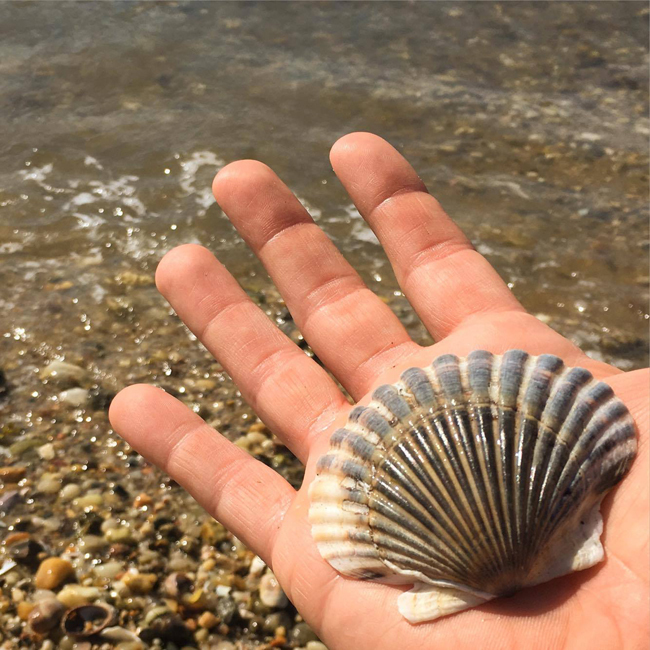 A scallop shell washed ashore in Long Island's Noyac Bay. These and other aquatic filter feeders (oysters, clams, mussels) face survival challenges in bays, estuaries and other waters due to a number of water quality issues, including seasonal acidification and hypoxia, the latter of which signifies low levels of dissolved oxygen in those waters. While pH imbalances in these aquatic environments impede survival of these bivalves, seagrass beds appear to moderate acidic intensifications and provide refuge for the species. Credit: Paul C. Focazio. SBU’s Bradley Peterson will assess the ability of seagrass to draw down carbon dioxide from the water, which could reduce the effects of ocean acidification. Peterson’s team will also determine if seagrass-modified water benefits adjacent habitats. Seagrasses could provide refugia – areas of more favorable conditions for calcified organisms such as corals and crustaceans – from the surrounding acidified waters. As such, the ecosystem services provided by seagrass could reduce the negative impacts of ocean acidification. Flood risk planning is increasingly important for coastal communities. New York’s Lake Ontario region saw unprecedented high water levels in 2017. NYSG responded to stakeholder requests for a standardized means of reporting the water level damages on waterfront properties by developing and conducting an online survey with the goals of documenting the parcel-level impacts of the event on waterfront properties, providing municipalities with information to assist community-based planning to reduce flood risks; and verifying existing flood risk modeling. Credit: Mary Austerman/NYSG. Scott Steinschneider, an assistant professor in the Biological and Environmental Engineering Department at Cornell University, is developing models of extreme lake levels, storm surges, and wave heights to help predict flooding events, such as along Lake Ontario in 2017. Social science data will supplement the research team development of decision-support tools for flood risk and planning. The 2017 flood on Lake Ontario has caused widespread damage in shoreline communities, as Steinschneider details in his related work at www.nyseagrant.org/waterlevel2017. This new project aims to close information and knowledge gaps, and create plans for evolving flood risks. 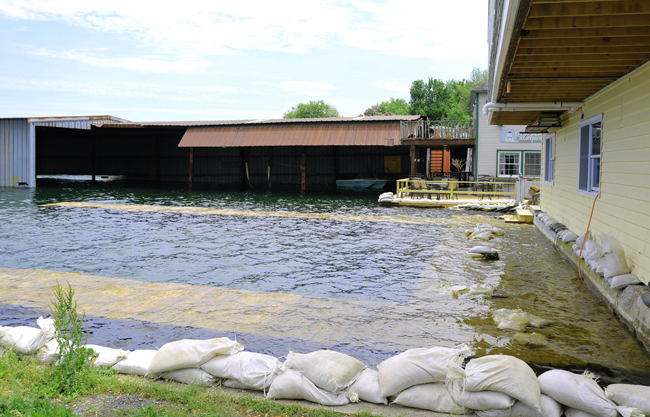 "Communities in the region feel that they lack the information necessary to recover from last year's flood," said Steinschneider. "This creates a barrier that inhibits the ability of these communities to adapt their planning efforts and build resilience to future flood events." Listeria monocytogenes, a food-borne microbial pathogen, typically contaminates food at low levels unlikely to cause disease. But it can grow to dangerous levels. 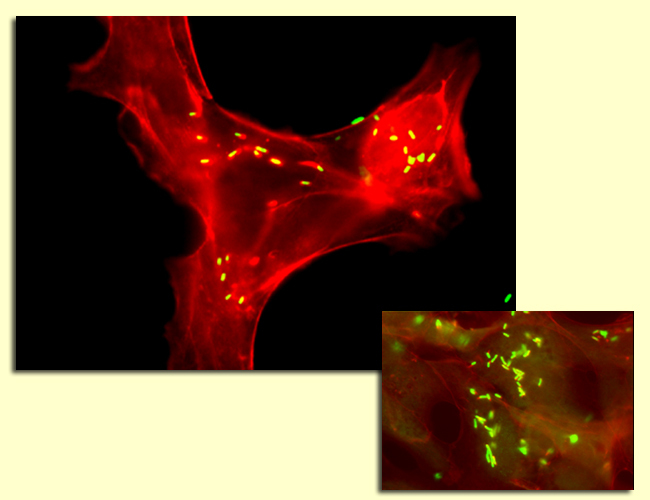 Photomicrograph inside an animal cell infected with Listeria monocytogenes, (yellow and green) a harmful pathogen occasionally found in ready-to-eat foods such as soft cheeses and smoked fish; (Inset) Higher magnification of the photomicrograph. In order to assure consumers that such foods are safe, the government has established a "zero tolerance" for this pathogen. While the common bacteria has been known to harm people with compromised immune systems, NYSG-funded research Martin Wiedmann from Cornell's Food Science Department believes only a fraction of Listeria strains are actually responsible for human disease. Credit: Martin Wiedmann, Cornell University. Martin Wiedmann, the Gellert Family Professor in Food Safety at Cornell University, will assess how Listeria grown under different conditions before contamination of salmon differs in susceptibility to the antibacterial compound Nisin. Listeria typically contaminates a wide variety of food (including meats, poultry, vegetables, and dairy products) at low levels unlikely to cause disease but can grow to dangerous levels. Foods implicated in outbreaks and sporadic cases almost always are refrigerated products that can support the growth of this organism, as it can exist under conditions that usually inhibit the growth of other pathogens such as temperatures as low as 34 degrees F.
Wiedmann’s research will take into account natural growth conditions that Listeria is exposed to in seafood processing facilities to help optimize application strategies for cold smoked salmon product packaging to benefit processors in both the Great Lakes freshwater and downstate saltwater regions of New York. For updates on Sea Grant activities: www.nyseagrant.org has RSS, Facebook, Twitter, and YouTube links. NYSG produces a monthly e-newsletter, "NOAA Sea Grant's Social Media Review," via its blog, www.nyseagrant.org/blog. Our program also offers a free e-list sign up via www.nyseagrant.org/nycoastlines for its flagship publication, NY Coastlines/Currents, which is published quarterly.